Despite everyone’s best efforts, the fact of the matter is that most people will require at least a little bit of restorative dentistry at some point in their lives. When natural wear and tear, decay, and accidents leave a smile looking and feeling far from its best, Dr. Cowell is able to provide the solutions DeLand families need. Using custom-designed restorations made with the finest materials, he can make even the most compromised smiles look like new again. If you’re ready to finally take care of your problem teeth or fill in the gaps, he’s ready to help you, so contact him today. Dentists and patients around the world agree that dental implants are simply the most complete tooth-replacement available today, and now you can get them right here in DeLand! Working with a team of local specialists, Dr. Cowell can bring back any number of missing teeth and give you a restoration that is the next best thing to nature. They look natural, last for decades, and they’ll help you reclaim your complete smile for a lifetime. 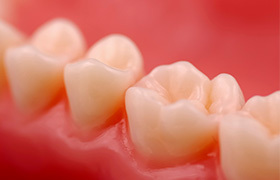 Whether you have a broken tooth or large cavity, we can design a dental crown to fix it. Thanks to Dr. Cowell’ attention to detail, he’ll make it look like you never had a dental problem in the first place! 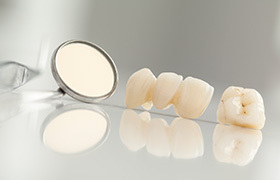 He can even use a couple of dental crowns to support a bridge to replace one or more missing teeth in a row. These are two of the most tried and true treatments in all of dentistry, and thanks to our team, they’re now better than ever. Using a tooth-colored filling, Dr. Cowell can quickly and easily repair a small cavity or slightly damaged tooth in just one visit without altering its appearance. Unlike a traditional amalgam filling that always leaves a large gray mark behind, tooth-colored fillings are made of a composite resin material that can be specially color-matched to a patient’s enamel. In the end, the filling itself is practically invisible in the mouth. And, because this material is metal-free, it also doesn’t make a tooth more sensitive to hot and cold temperatures. Whether you are missing a few teeth or an entire row, Dr. Cowell can design a denture just for you that will help you eat, speak, and smile with complete confidence again. 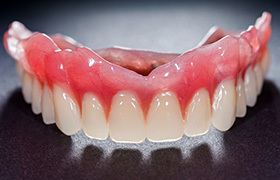 Partial dentures can replace missing teeth located throughout the mouth while fitting comfortably with the remaining ones (like the piece of a puzzle), while full dentures can instantly bring back an entire arch of teeth. To help patients have the most secure and stable fit possible, we can even help them get implant-retained dentures right here in DeLand.